Life Gives You Meyer Lemons? Make Limoncello. 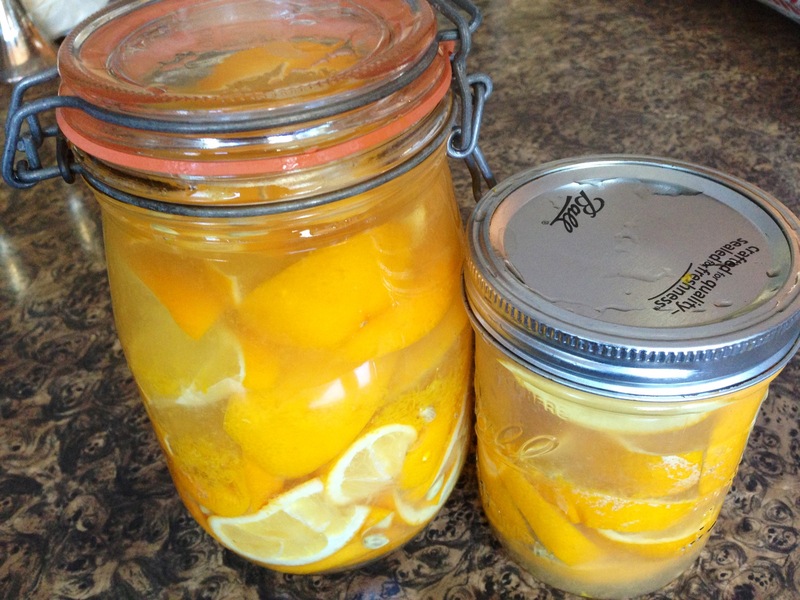 Meyer lemons (with juice, not just the rinds as traditional) marinating in vodka. 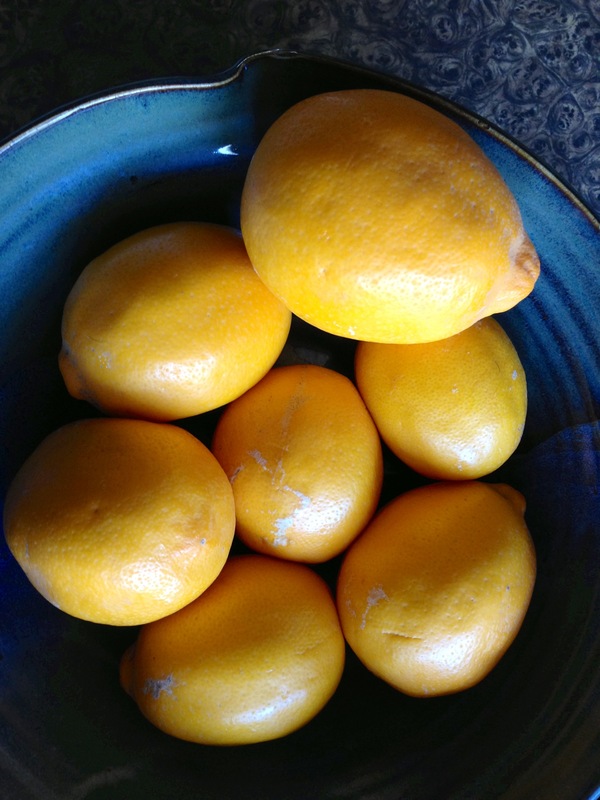 Meyer lemons in the store are often tinged with a mildewy flavor. The problem is the rare lemon-orange hybrid citrus ripens quickly and, since it isn’t so self-stable, doesn’t travel easily. They’re a formerly disease-prone hybrid that actually originated in China. So most of the Meyer lemons I’ve had have been a disappointment. Until now. I was surprised this week with eight perfectly ripe Meyer lemons from a new colleague of Dan’s who hails from Salida, California, and studied at UC-Santa Cruz. They were a gift in exchange for our offer to dog-sit his sweet Julia, a brindled former Mexican street dog Marcos adopted while doing field work there about five years ago. While Theo loved our friend‘s pit-bull Baba, he appears to have developed a new-found fear of canines that I’m hoping to nip in the bud, through aversion therapy:) The gift of the Meyer lemons this week only sweetened the deal. Marcos relayed that the Meyer lemons come from the backyard of the house where he grew up. His dad passed away last September and since his mom no longer lives there, the tree was loaded with almost overripe fruit. The tree was one of his dad’s prized possessions, in addition to his key lime tree. This detail made me all the more honored to have this fruit, which I approached with reverence. It was tangy-sweet just squeezed into the mouth and into seltzer water. Nothing like ripe Meyer lemons from California to brighten a grey, cold January day in Maine. But a quick search of the web made me realize that when life gives you ripe Meyer lemons, one should turn to limoncello before they go south. I’ve never made limoncello before but have long wanted to. Dan feel in love with it and other fruit liqueurs traveling with his cousin in Italy that summer 2003 just weeks before we met. Most limoncellos only call for the rind but I had golden orbs bursting with juice. I did squeeze a little into my now-famous scallop ceviche. The rest are quartered and bathing in vodka for Meyer Lemon Limoncello, as instructed by the excellent Oregon food blog Voodoo & Sauce (I once interviewed blogger Heather about foraging for stinging netttles). Zester Daily seconded her approach. Next time, I’ll try Meyer lemon mayonnaise.